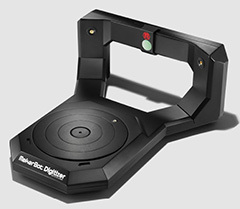 The Makerbot Digitizer is a 3D scanner that can turn real objects into digital 3D files suitable for printing. The Digitizer can scan objects up to 8" in diameter and 8" tall. The Digitizer is controlled via the free Makerbot Desktop Software, available here. The Digitizer must be plugged in, via USB cable, to the computer running Makerbot Desktop. The Maker Hub has a workstation available to use with the Digitizer. Check the Maker Hub Calendar for workshop availability. To get started with the Digitizer, check out the resources here.